Written in a tutorial style, the emphasis is on learning through example and a number of well known problems in designing and programming concurrent fault-tolerant real-time systems are illustrated. Erlang is a concurrent, functional programming language designed for programming large industrial real time systems. The language is untyped and has a pattern matching syntax. Functions are written as a set of recursion equations and the language has explicit concurrency and asynchronous message passing. Erlang provides explicit concurrency, has asynchronous message passing and is relatively free from side effects. Written in a tutorial style, the emphasis of this book is on learning through example and a number of well known problems in designing and programming concurrent fault-tolerant real-time systems are illustrated. Distributed Erlang programs can run transparently on cross-platform multi-vendor systems. The language has primitives for detecting run-time errors and for dynamic code replacement (i.e. changes to code can be made in a running real-time system, without stopping system). Erlang has real-time GC, modules and a foreign language interface. Erlang was developed at the Ellemtel Telecommunication Systems Laboratories and is used within Ericsson for product development and prototyping. :) "In general, this book was well worth the money paid. 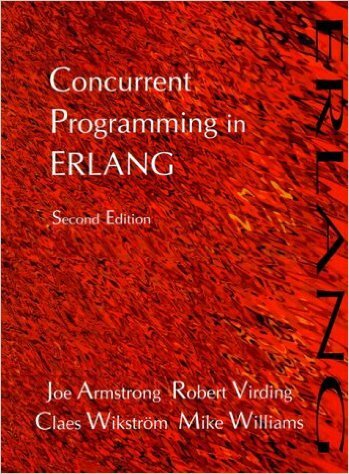 It's reasonably comprehensive and written for people who actually plan on writing Erlang programs. Furthermore, it even uses understandable real-life examples."